The year 2018 saw a number of changes from a resource management perspective for the National Community. These changes, summarized below, call us to review both how our community utilizes its resources in fulfilling our apostolic and communal obligations, as well as our personal commitment in supporting the community. As announced in the recent National Convention, the Leadership Community has started shifting its financial reporting from standard financial statements to a format that shows us how resources are utilized towards programs for (1) internal formation, (2) community development, and (3) apostolic works (sub-classified into the four frontiers). This shift signals a more intentional approach to planning and resource allocation. If we, as a community, for example, say that we want to prioritize Family ministry as an apostolate, then our budget and actual financial reports should reflect greater resource allocation towards programs for families. In 2019, as we are called to discern a greater involvement in the Lord's mission, the National LC intends to work towards more apostolic endeavors. This would require greater resources and involvement from everyone in the community. The resources we have historically received have allowed us to support the various programs we offer our members and the public. It has also enabled us to initiate projects directed towards the four frontiers, especially subsidies for the formation for families, the poor, and the youth. Towards the closing of 2018, several changes have resulted in potential reduction in these revenue streams. First, our current tenant for Leunis Hall (Philippine Jesuit Aid Association - PJAA) has decided to relocate their office. As we search for a new tenant, we anticipate a decrease in overall rental income. Historically, this stream contributes Php 440,000 annually to total revenue. It should also be noted that we still have some obligations to pay for the CLC Center. Second, we will no longer receive the management fee from Mirador. Conversations with the Province about the status of Mirador with all the renovations has led to CLCP shifting responsibility from managing Mirador to focus on developing formation programs at Mirador. The recently concluded World Assembly in Buenos Aires last August ratified a commitment for all National Communities to increase their financial support of the World community through our annual dues payments to cover the costs of operation of the World ExCo and Community. The shift in dues to World CLC has increased by P110,000 per year. The membership drive will help us ensure we have correct numbers reported to the World Secretariat and that we pay the correct amount in support of our World Community. It also will help us be properly represented at the World Assemblies and other events as one of the larger national communities in the world. In the context of these changes, we hope our communities can also reflect upon the Grace from the World Assembly as we deepen our common apostolic commitment to be one with Christ through our community in CLC. 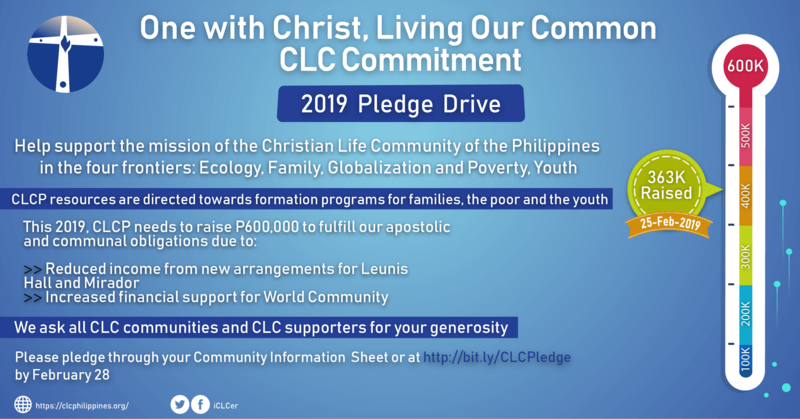 In the recent correspondence released by the Community Development team, a pledge program is included wherein the membership fee and tithing have been rolled into one pledge. A target of Php 600,000 was also provided. This amount will help ensure we have the financial flexibility to develop and support programs in our on-going apostolic mission of formation for social transformation.